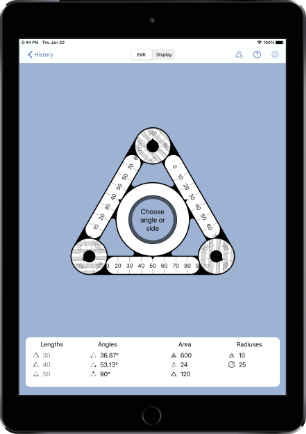 The formulary with the law of cosines can stay in the drawer: Trivice HD let you calculate the values of any given triangle. The input is done completely without the keypad by using the graphical controllers on the edges and sides. The controller in the middle sets the fraction digits. The calculation includes all angles and lengths as well as area, height and incircle and circumcircle. The result is also displayed graphically. The last 10 calculations can be recalled from the history. The number of fraction digits for input and result can be defined in the settings. It is also possible to use fractions for the input, for example for inch values. One controller has always to be selected with a tab. The active controller is marked by a black arrow. Are there any plans for a numeric input? Tricive was designed from the ground up without numeric input. Numeric input is not planned for future versions. What are incircle and circumcircle? The incircle ofr inscribed circle is the circle that touches the triangle on all three sides. The circumcircle or circumscribed circle is the circle that passes through all vertices of the triangle. For a triangle, exactly one incircle and circumcircle is existing.